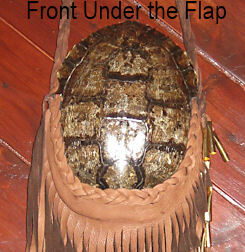 This unisex turtle bag is made from butter soft buckskin and a real whole turtle shell. The turtle shell is approximately 6 inches x 8 inches and is lined on the inside. A buckskin braid decorates the front of the shell under the flap. Not counting the shoulder strap, overall length of this bag is 27 inches. This turtle bag has two layers of extra long fringes o the flap closure and around the bottom of the bag. 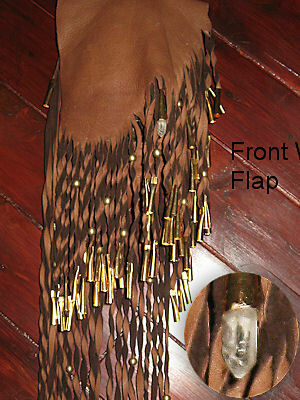 The fringes are decorated with solid brass trade beads and each fringe is tipped with a brass cone. There is a quartz crystal on the flap fringes to repel negative energy. This bag would make the perfect addition to your dance regalia, rendezvoux or re-enactment outfit, or to add to your native american collection. This bag is also built strong enough for daily use as a purse. The bag shown is the one you will receive. This product was added to our catalog on 03/20/2009.